Affordable yet more refined than most, the Nissan Murano is an excellent midsize crossover choice, not just for families, but empty-nesters and single households as well. It competes with some of the more luxurious brands, yet manages to keep its price grounded and more attainable for a wider variety of drivers. The 2017 Nissan Murano in Glendale Heights, IL is a five passenger vehicle that does not offer a third row of seating. Its upscale and spacious interior creates an open and comfortable atmosphere. Cargo Space: The Nissan Murano’s power liftgate can be controlled in a variety of ways. Raise and lower the hatch with a press of a button on your remote, the dash, or on the hatch itself. Behind the rear seats is 45-inches and behind the passenger seats is 74.5-inches. Simply collapse the rear seats that split and fold in order to create 69.9 cu-ft of flexible storage space. Colors: Magnetic Black, Gun Metallic, Java Metallic, Cayenne Red, Brilliant Silver, Pearl White, Arctic Blue Metallic, and Pacific Sunset. 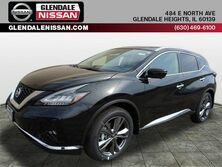 Interested in a 2017 Nissan Murano? A single engine is carried across each of the Nissan Murano trim levels, a 260-horsepower 3.5L V6. Even as a more powerful midsize crossover, the 2017 Nissan Murano is capable of earning a fuel economy rating of 21 city/ 28 hwy mpg. Its engine is paired with Nissan’s continuously variable transmission to ensure optimal shifting and the best possible mileage without dulling the ride. Directly before the driver lies an Advanced Drive-Assist Display, here programmable information can be found on a high resolution 7-inch screen. The driver can see what song is playing, how many miles are left in the gas tank, the time and temperature, as well as turn-by-turn directions and the individual tire pressure readings of each tire.